Blog - Weekend Sale! Vintage U.S. Gold @ 3%?! 2017 has been a great year for the gold investor/collector. Despite steadily increasing interest rates and a strong stock market, gold prices are up almost 12% on the year and there appears to be even more upside in the future. While prices have continued to climb, there has been an oversupply in the physical market, which has pushed premiums on some items to near all-time lows. This is a unique time in the gold market. Typically, higher gold prices lead to higher premiums, but right now there is an aberration in the market. Low premiums are still there for the taking while physical demand catches up with available supply. In short, buying gold for the long term has almost never been as good an opportunity as it is right now. One of the best examples of this aberration in the gold market is seen in pre-1933 U.S. Gold, specifically $20 Saint Gaudens & $20 Liberties. These coins are some of the most popular gold coins in U.S. history, but have mostly been off limits to investors due to high premiums over their gold content. Usually, XF $20 Saints/Liberties trade at 10%-20% or more over their gold value. Today, however, you can buy XF $20 Saint Gaudens & $20 Liberties at lower premiums that you would pay on mainstream bullion products. Even lower than 1 oz American Gold Eagles, 1 oz Canadian Gold Maples and 1 oz South African Krugerrands! How can we offer prices this low? We just acquired a large group of XF $20 Saint Gaudens & $20 Liberties from a large estate and we want to pass the savings along to you. For this weekend only, we are offering these coins to you at only $37.99 over spot! This represents the best price we have ever offered on these coins, as well as the best price you will find anywhere online for the same material. 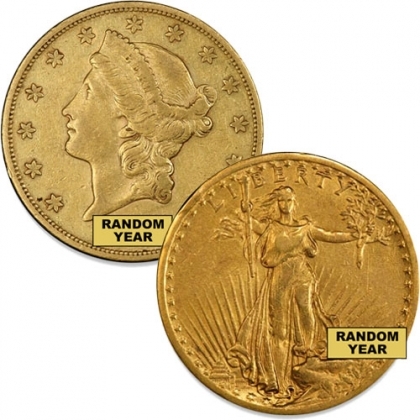 In fact, this price is lower than what we have found online for damaged or jewelry grade $20 gold coins! Take advantage of this special opportunity during this weekend only! Deals like this don't come around often, and if you are a long term believer in gold, this might be your best chance to buy gold very close to spot!